Proud of Our Successful Conference in Florence! The IFDH held the Global Oral Health Strategy Session in Florence the weekend of July 7th and 8th. There were IFDH members from 17 countries represented and all had a wonderful and informative time sharing and offering programmes in their countries. Professor Raman Bedi (UK) emphasized the importance of attaining leadership skills to create change in global oral health. Professor Ken Eaton (UK) informed us of the economic costs of poor oral health. Yvonne Nyblum (Sweden) discussed the Erasmus programme in Europe. Dr Onno Hofman (The Netherlands) told us about the Ivory Cross programmes in the Netherlands. Wil Pelksman (The Netherlands) presented her work with the elderly. She also presented a workshop to explain her course to 'train the trainers' in elderly care. I showed the participants how to present the outcomes of their projects at ISDH Korea. Professor Wendell Evans (New Zealand) gave his expert advice on measurement of Early Childhood caries, which will soon be published in the WHO manual. Dr David Walker (Honorary Research Fellow, University of Sydney) showed us how to design our projects with a template and a presentation on project design. We were very honoured and privileged to have these wonderful speakers and the feedback form attendees reflected their appreciation for the content that the Board worked hard to provide. Mary Rose, our treasurer and local hostess, did a wonderful job of making sure all attendees were accommodated and had a wonderful time in Florence with a rooftop cocktail evening (sponsored by the Italian Dental Hygiene Association - AIDI) at the Hotel Baglioni and a magical evening at the Florence Rowing Club on the banks of the Arno River. My sincere gratitude to all who attended and made this conference such a great success! We also are very appreciative of our sponsors, Dentsply-Sirona, Colgate, GSK, and Crest Oral Care (P&G). Click to read more and see some photos! Prior to arriving in Florence I visited Seoul to meet with the KDHA and participate in their 40th Anniversary. Mrs Moon, Kyun-Sook and the KDHA were generous hosts at the COEX venue, where we will be holding the ISDH 2019. See their report in this month's newsletter. The Board of Directors and International Scientific Committee,, chaired by our Past President Dr JoAnn Gurenlian, will now be moving forward with plans for ISDH 2019 in Korea. Congratulations to KDHA on their 40 year Anniversary! The World Congress on Public Health was held in Melbourne on April 7th where I attended the 'Special Dialogue' Oral Health and had the opportunity to meet leaders in Public Health. 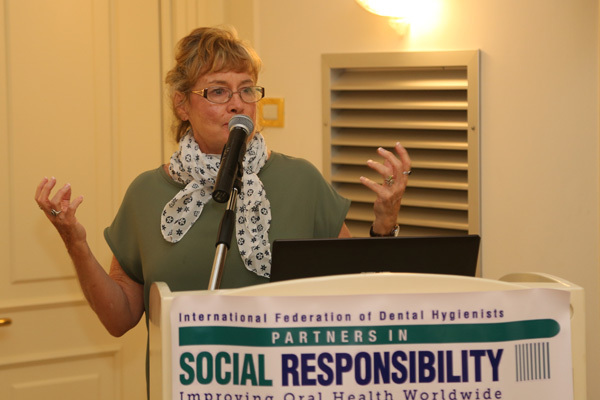 Professor Bedi, the Chair of the Oral Health Committee and Global Child Dental Fund, and who also presented at the Social Responsibility conference in Florence, has been awarded an Honorary Fellowship to the Faculty of Public Health. Our Congratulations to Professor Bedi, well deserved for his years of service the dental profession.